It’s mid-August. Westport is as empty as it’s ever going to be. Sure, it’s humid. But you won’t get heat exhaustion walking from the small parking lot on Avery Place, to the rear entrance of Chase Bank. 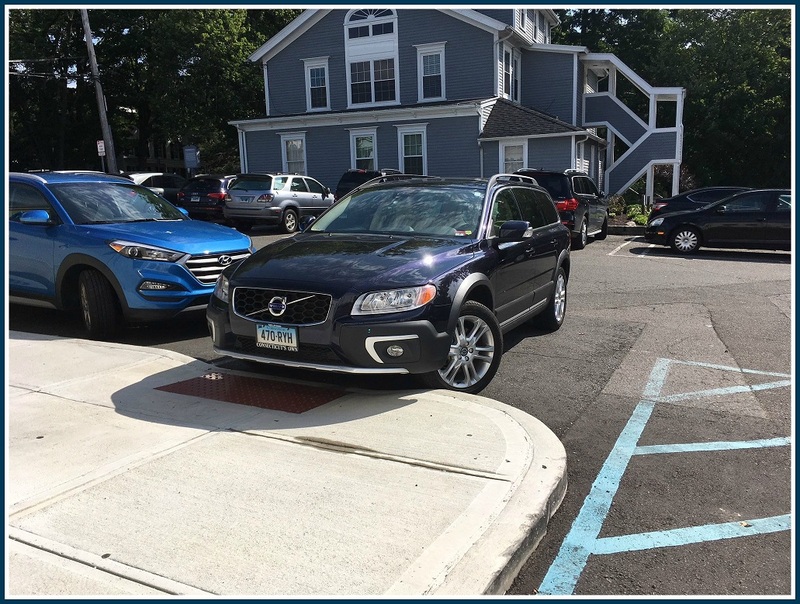 Of course, there are a couple of handicap spots for people who need them. Those folks are issued big blue placards. This person does not have one. And technically, he did not steal a handicap space. But he — and judging by the aggressive parking job, I’m assuming it’s a guy — created his own personal parking spot by hogging the ramp next to a handicap one. You can clearly tell it’s there, by the robin-blue marking. This happened at 10 a.m. There were plenty of spots available, says the “06880” reader who sent the photo to me. She wants to remain anonymous. There’s no telling what someone as selfish as this could do to someone who simply wants common courtesy (and common sense) to prevail. This entry was posted in Downtown, Transportation and tagged Avery Place parking lot, entitled parkers. Bookmark the permalink. Have you ever clarified with Westport Police if a picture of an obvious violation is grounds for a ticket & fine? Not sure of the legalities but it seems like the violation is clear and the car’s plate is clear too. The picture is proof so at least could the driver/car owner get a ticket. I’m sure the police don’t need an influx of vigilantes’ pictures, etc but perhaps some tickets would take the steam out of the entitled peeps? I didn’t take a picture but I walk right buy an older man parking in two spots – he went right over the middle line between the spaces – in a crowded lot where Lester’s, Dunkin, and Westport Hardware share parking off the Post. I politely pointed it out to him and he scoffed at me – “who cares, I won’t be long” was his rationale. Not worth a debate to me but when someone “caught” red-handed doesn’t care, you can’t expect them to change behavior. But if I knew a fine in this situation was a possibility to someone not wanting to correct himself, I’d have taken the picture in a heartbeat. You posting these pictures isn’t solving anything. How about the police weighing in? The people whose photos are posted are not embarrassed, apparently. I’d love to hear the police POV. Perhaps our parking attendants should drive around looking for offenders like these we see so often rather than chalking tires. Agree with everything you said, Mark. But what did the “older” have to do with the comment? The car block the ramp for handicap people with wheelchair . this happens many times. I once called the police, nothing happened. Until there’s a response from the police, it will continue. Visitors from out of town often remark on the rudeness of drivers here But they may just be passing through and not be from Westport. I am handicapped and must us a walker. To enter the bank I must use the cut. In 7 Years of Aided navigation only one person has refused to helpme…just too busy. This might have been #2. had I needed to go there. A hasty generalization? Maybe. Try navigating with a walker and see what your day is like…..The good news is most people offer help without being asked. Right on Westporters!! Why the hell would you assume it’s a man at fault. “Agresive” driving has little to do with it..I would bet it’s a woman, which simply means that we’re both sexist in our own way. I parked behind the car in question at the Wilton Library a few weeks ago. (I recalled the car because it has a distinctive sticker on the back.) The driver was an elderly woman. I printed out Dan’s posting in the library and added “Please be more considerate when you park. I placed the printout on the back windshield of the car. I hope she got the message. This is terrible. Wonder if the driver has ever had to navigate a wheelchair or a walker off a curb because the curb cut is blocked? I did it repeatedly when my husband was ill – there are lots of rude people around. It’s dangerous, it’s physically difficult and it’s unnecessary. Whether the driver is male or female, old or young, they should be ticketed. It’s a private parking lot. The police have no jurisdiction. It would need to be explicitly marked for no parking. Then the owner of the property can take action by calling the police, notifying them of the problem, giving them the information and to where he is having the car towed (like to New Haven) where the owner can pick it up at their convenience and at their own personal cost.